Three senior staff and four PhD students are conducting basic and clinical research on shoulder, elbow, and hand surgery. The main topics are tendon biology, tendinosis pathology, and its regeneration. We are also interested in outcomes of massive rotator cuff reconstruction using autologous fascia graft and reversed shoulder arthroplasty. Ultrasonography is a real-time, noninvasive technique to assess muscle and tendon. We are analyzing those structures and biomechanical characteristics under pathological conditions. Pain is one of most difficult symptoms assessed subjectively. We are using a pain-quantitating device and analyze its association with other parameters. Accumulation of oxidative stress during aging is one of the causes of tendinosis. We are analyzing these factors in in vivo and in vitro tendinosis models. Scaffold, growth factor, and stem cells are key factors for successful tendon tissue regeneration. We are focusing on absorbable biomaterial and CELL SHEET to treat massive rotator cuff tears. The muscle weakness after nerve or tendon injury negatively affects the clinical outcomes. Analysis of muscle progenitor cell and controlling it is one of the key factors to obtain good clinical results. (1) Kokubu T, Mifune Y, Inui A, Kuroda R. Arthroscopic Rotator Cuff Repair With Graft Augmentation of Fascia Lata for Large and Massive Tears. Arthrosc Tech. 2016 Oct 31;5(6):e1235-e1238. (2) Muto T, Kokubu T, Mifune Y, Inui A, Sakata R, Harada Y, Takase F, Kurosaka M. Effects of platelet-rich plasma and triamcinolone acetonide on interleukin-1s-stimulated human rotator cuff-derived cells. Bone Joint Res. 2016 Dec;5(12):602-609. (3) Mifune Y, Inui A, Sakata R, Harada Y, Takase F, Kurosaka M, Kokubu T. High-resolution ultrasound in the diagnosis of trigger finger and evaluation of response to steroid injection. Skeletal Radiol. 2016 Dec;45(12):1661-1667. (4) Takase F, Inui A, Mifune Y, Sakata R, Muto T, Harada Y, Ueda Y, *Kokubu T, Kurosaka M. The effect of platelet-rich plasma on degeneration change of rotator cuff muscles: In vitro and in vivo evaluations. J Orthop Res. 2016 Sep 29. doi: 10.1002/jor.23451. (5) Inui A, Nishimoto H, Mifune Y, Kokubu T, Sakata R, Kurosaka M. Ultrasound measurement of median nerve cross-sectional area at the inlet and outlet of carpal tunnel after carpal tunnel release compared to electrodiagnostic findings. Arch Orthop Trauma Surg. 2016 Sep;136(9):1325-30. (7) Kawakami Y, Matsumoto T, Mifune Y, Fukui T, Patel KG, Walker GN, Kurosaka M, Kuroda R. Therapeutic Potential of Endothelial Progenitor Cells in the Field of Orthopaedics. Curr Stem Cell Res Ther. 2016 Aug 10. (11) Muto T, Kokubu T, Mifune Y, Inui A, Sakata R, Harada Y, Takase F, Ueda Y, Kuroda R, Kurosaka M. Can Platelet-Rich Plasma Protect Rat Achilles Tendons From the Deleterious Effects of Triamcinolone Acetonide? Orthop J Sports Med 3(7), 2015. (12) Sakata R, Kokubu T, Mifune Y, Inui A, Nishimoto H, Fujioka H, Kuroda R, Kurosaka M. A new bioabsorbable cotton-textured synthetic polymer scaffold for osteochondral repair. Int Orthop 38(11): 2413-20, 2014. (13) Nagura I, Kanatani T, Sumi M, Inui A, Mifune Y, Kokubu T, Kurosaka M. Management of intolerance to casting the upper extremities in claustrophobic patients. ScientificWorldJournal 2014: 803047, 2014. (14) Muto T, Kokubu T, Mifune Y, Inui A, Harada Y, Yoshifumi, Takase F, Kuroda R, Kurosaka M. Temporary inductions of matrix metalloprotease-3 (MMP-3) expression and cell apoptosis are associated with tendon degeneration or rupture after corticosteroid injection. J Orthop Res 32(10): 1297-304, 2014. (15) Kanatani T, Nagura I, Kurosaka M, Kokubu T, Sumi M. Electrophysiological assessment of carpal tunnel syndrome in elderly patients: one-year follow-up study. J Hand Surg Am 39(11): 2188-91, 2014. (16) Harada Y, Kokubu T, Mifune Y, Inui A, Sakata R, Muto T, Takase F, Kurosaka M. Dose- and time-dependent effects of triamcinolone acetonide on human rotator cuff-derived cells. Bone Joint Res 3(12): 328-34, 2014. (17) Muto T, Kokubu T, Mifune Y, Sakata R, Nagura I, Nishimoto H, Harada Y, Nishida K, Kuroda R, Kurosaka M. Platelet-rich plasma protects rotator cuff-derived cells from the deleterious effects of triamcinolone acetonide. J Orthop Res 31(6): 976-82, 2013. (18) Mifune Y, Ota S, Takayama K, Hoshino Y, Matsumoto T, Kuroda R, Kurosaka M, Fu FH, Huard J. Therapeutic advantage in selective ligament augmentation for partial tears of the anterior cruciate ligament: results in an animal model. Am J Sports Med 41(2): 365-73, 2013. (19) Mifune Y, Matsumoto T, Takayama K, Terada S, Sekiya N, Kuroda R, Kurosaka M, Fu FH, Huard J. Tendon graft revitalization using adult anterior cruciate ligament (ACL)-derived CD34+ cell sheets for ACL reconstruction. Biomaterials 34(22): 5476-87, 2013. (20) Mifune Y, Matsumoto T, Takayama K, Ota S, Li H, Meszaros LB, Usas A, Nagamune K, Gharaibeh B, Fu FH, Huard J. The effect of platelet-rich plasma on the regenerative therapy of muscle derived stem cells for articular cartilage repair. Osteoarthritis Cartilage 21(1): 175-85, 2013. (21) Mifune Y, Matsumoto T, Murasawa S, Kawamoto A, Kuroda R, Shoji T, Kuroda T, Fukui T, Kawakami Y, Kurosaka M, Asahara T. Therapeutic superiority for cartilage repair by CD271-positive marrow stromal cell transplantation. Cell Transplant 22(7): 1201-11, 2013. (22) Inui A, Iwakura T, Hari Reddi A. Regulation of lubricin/superficial zone protein by Wnt signalling in bovine synoviocytes. J Tissue Eng Regen Med, 2013. (23) Sakata R, Kokubu T, Nagura I, Toyokawa N, Inui A, Fujioka H, Kurosaka M. Localization of vascular endothelial growth factor during the early stages of osteochondral regeneration using a bioabsorbable synthetic polymer scaffold. J Orthop Res 30(2): 252-9, 2012. (24) Nishimoto H, Kokubu T, Inui A, Mifune Y, Nishida K, Fujioka H, Yokota K, Hiwa C, Kurosaka M. Ligament regeneration using an absorbable stent-shaped poly-L-lactic acid scaffold in a rabbit model. Int Orthop 36(11): 2379-86, 2012. (25) Mifune Y, Matsumoto T, Ota S, Nishimori M, Usas A, Kopf S, Kuroda R, Kurosaka M, Fu FH, Huard J. Therapeutic potential of anterior cruciate ligament-derived stem cells for anterior cruciate ligament reconstruction. Cell Transplant 21(8): 1651-65, 2012. (26) Kanatani T, Nagura I, Sumi M, Kokubu T, Mifune Y, Nishida K, Kurosaka M. A coincidental anterior interosseous nerve palsy after volar plate fixation of a distal radius fracture diagnosed by 3D-CT. Kobe J Med Sci 58(4): E96-8, 2012. (27) Inui A, Kokubu T, Mifune Y, Sakata R, Nishimoto H, Nishida K, Akisue T, Kuroda R, Satake M, Kaneko H, Fujioka H. Regeneration of rotator cuff tear using electrospun poly(d,l-Lactide-Co-Glycolide) scaffolds in a rabbit model. Arthroscopy 28(12): 1790-9, 2012. (28) Inui A, Iwakura T, Reddi AH. Human stem cells and articular cartilage regeneration. Cells 1(4): 994-1009, 2012. (1) Nagura I, Kanatani T, Sumi M, Kokubu T, Kurosaka M. Recurrence of Enchondroma in a Middle Finger after Curettage and Back-filling with Calcium Phosphate Bone Cement: a Case Report. Kobe J Med Sci. 2016 Jun 16;62(1):E19-21. (2) Mifune Y, Inui A, Takase F, Ueda Y, Shinohara I, Kuroda R, Kokubu T. Two Extension Block Kirschner Wires' Technique for Bony Mallet Thumb. Case Rep Orthop. 2016;2016:8086594. (3) Inui A, Suzuki T, Kokubu T, Sakata R, Mifune Y, Kurosaka M. Carpal Tunnel Syndrome Caused by Tumoral Calcinosis. Case Rep Orthop.170873, 2015. (4) Inui A, Kokubu T, Mifune Y. Volar dislocation of index and middle finger carpometacarpal joints: a case report. J Hand Surg Eur 40(1): 99-100, 2015. (5) Nagura I, Kanatani T, Sumi M, Inui A, Mifune Y, Kokubu T, Kurosaka M. Management of intolerance to casting the upper extremities in claustrophobic patients. ScientificWorldJournal. 2014;2014:803047. doi: 10.1155/2014/803047. (6) Takase F, Inui A, Mifune Y, Muto T, Harada Y, Kokubu T, Kurosaka M. Concurrent rotator cuff tear and axillary nerve palsy associated with anterior dislocation of the shoulder and large glenoid rim fracture: a "terrible tetrad". Case Rep Orthop : 312968, 2014. (7) Kanatani T, Fujioka H, Kurosaka M, Nagura I, Sumi M. Delayed electrophysiological recovery after carpal tunnel release for advanced carpal tunnel syndrome: a two-year follow-up study. J Clin Neurophysiol. 2013 Feb;30(1):95-7. doi: 10.1097/WNP.0b013e31827ed839. 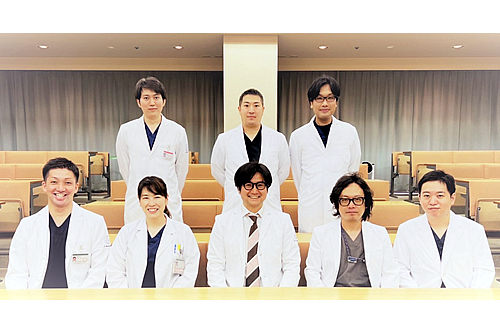 (8) Nagura I, Kokubu T, Fujioka H, Mifune Y, Nishida K, Akisue T, Kuroda R, Kurosaka M. Nontraumatic true aneurysm of the superficial palmar arch: a case report. Kobe J Med Sci 58(1): E29-32, 2012. (9) Mifune Y, Yagi M, Iwasaki Y, Doita M. Pseudoaneurysm of Lumbar Artery following a Vertebral Biopsy: A Case Report. Case Rep Radiol 2012: 127124, 2012. (10) Kokubu T, Nagura I, Mifune Y, Kurosaka M. Arthroscopic bony bankart repair using double-threaded headless screw: a case report. Case Rep Orthop 2012: 789418, 2012.